Since I led a webinar this week about Twitter and Facebook usage this week for HigherEdHero, I’ve received a lot of questions from folks wanting to know how we added a custom tab to my institution’s fan page. I thought it’d be a worthwhile blog post to show you how we did it, and to see if there are easier ways to accomplish what we have. 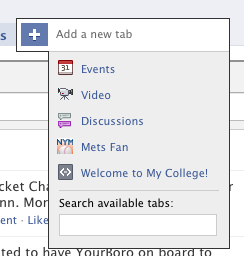 Here’s how to add a similar tab to your institution’s fan page. Keep in mind you must be an administrator of the page you want to add the tab to. First, search for the FBML app. You can just enter in FBML in the search box on any page. You’ll want the application called Static FBML. It will look like this. You can click for a larger size image. 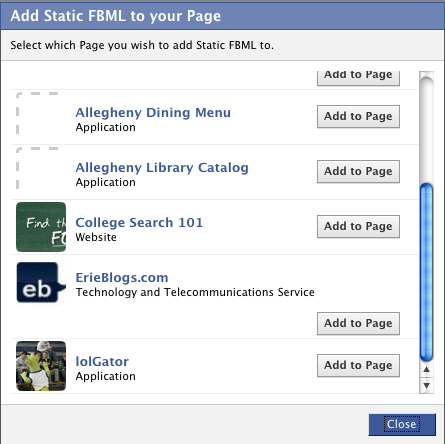 When you add it to your page, you can choose what pages or applications you want to add the FBML to. 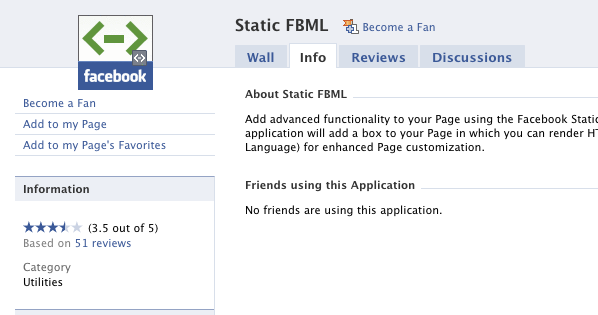 You can add it to multiple pages, but be aware that you can only have 1 FBML application on a page, unfortunatly. At this point, begin editing your page. Find the FBML area and click on the pencil icon to start editing it. You’ll be given an area where you can title your box as well as edit the content. In box title, enter what you want the text of your tab to say. Don’t worry if you don’t know FBML, you don’t need to. You can put straight up HTML in here, complete with images and more. When you click the plus sign, you should see all the applications and content you can add as a tab. One of the choices should be the box name you entered when editing the FBML box. Click on it and it will be added to your page. Click on the tab and if everything’s gone correctly, you should see the HTML content you entered in. Here’s what I see using the HTML I entered a few screens ago. There you go – you should now have a brand new tab on your fan page you can add all sorts of neat content to. As I said earlier, as far as I know, you can only have 1 FBML app on a page at a time, thus just one custom tab. If you know a better way to accomplish this, please let me know.